Ms. Snip: I watched a funny new show on TV today. I’m not sure what the plot was but it reminded me of shows like “Housewives” or “Jersey Shore”. Like one of those ‘reality’ shows where people just show their stupid side for the camera. Ms. Snipe: Hmmm, I missed that one. Do you remember what it was called? Ms. Snip: I think it was something like “Investigations” or maybe “Point of Order”, they seemed to say that a lot. Ms. Snipe: Oh. You were watching the latest edition of what I call “Irresponsible Republicans Acting Badly”. Somehow there is a group of TV hungry pubs who feel it necessary to revisit investigations already held and cleared by the General Counsel and other committees. It would be a comedy if it weren’t such a deplorable waste of time and money. They seem to act as if there was nothing else going on in the country. Meanwhile the narcissistic Big Crybaby (BC) has thousands of children in custody crying for their parents. He consistently demeans the leaders of countries which have been our allies for decades. Then, to ensure market instability, he establishes exorbitant tariffs which may put our farmers and others at risk. At the same he expresses admiration for the dictators/leaders of adversary countries. Ms. Snip: I suppose that means that the program won’t be a weekly series then. I was really looking forward to watching every week. 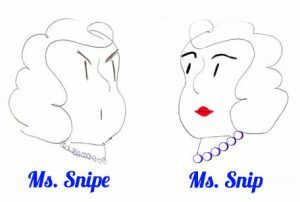 Ms. Snipe: No, not that one but there will be others. Or, you could always sign up for Twitter if you wanted to see how ridiculous and troublesome BC is. Or, you could just watch the waggish trio (WT) early morning on that animal-named channel. Word has it that BC gets much of the rhetoric for his tweets right there. It’s especially amusing when he takes what they have said and: 1] misinterprets it, 2] changes it enough to misrepresent what was said, 3] repeats things that don’t stand up to fact-checking. He has replaced security briefings with WT. I guess that could be funny if it weren’t so dangerous. Ms. Snip: Do you watch that animal-named channel? 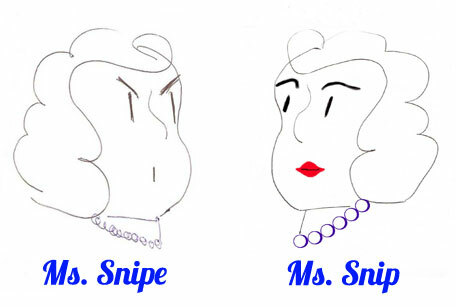 Ms. Snipe: Of course. I watch as many different ones as possible. Sometimes I will switch from what I consider to be an important story to a channel with an opposing viewpoint just to compare the stories and approaches. Of course, if the news shows the weakness of one side, I switch in the middle of the report to see what is being covered on the other. That was especially enlightening as both sides analyzed the Strzok investigation. Ms. Snip: Is there any good comedy I can watch that doesn’t go on for hours like “Point of Order” did? Ms. Snipe: You could check out The Big Bang. Of course, even that has some political ramifications. There are those who deny that the world came to be in that way. They don’t believe that species evolve. Maybe they are right. It seems that House Republicans serving on the committees investigating Strzok haven’t evolved. Still stuck in the Dark Ages.